December 20, 1901 photograph of a woman identified on the reverse as Genevieve Hogan. The photograph was taken by the McKay studio of Calais, Maine. 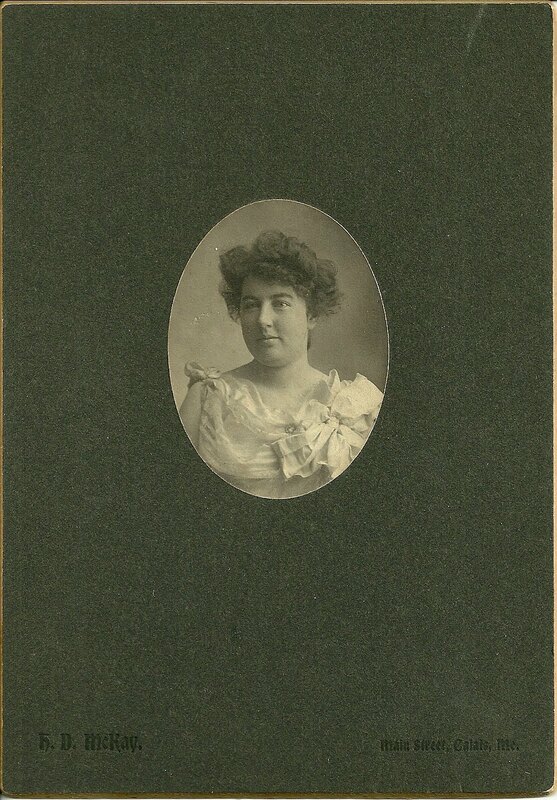 Genevieve Hogan was born about November 1881 in Maine, daughter of Richard and Martha Jane (Daley) Hogan, who were born at Calais, Maine, and nearby Milltown, New Brunswick, respectively. By the time of the 1900 Census of Calais, Maine, Genevieve's father had died, and Martha was remarried to Michael McDermott, with Genevieve and two of her Hogan siblings also in the household. By the time of the 1910 Census, Genevieve had left the household. Thanks for that info, Ellen. The Maine and Maritime Canada connection is so interesting - have it in my own family.